"Hydroxyprogesterone" redirects here. For other uses, see Hydroxyprogesterone (disambiguation). Not to be confused with Hydroxyprogesterone caproate or Hydroxyprogesterone acetate. 17α-Hydroxyprogesterone (17α-OHP), or hydroxyprogesterone (OHP), is an endogenous progestogen steroid hormone related to progesterone. It is also a chemical intermediate in the biosynthesis of many other endogenous steroids, including androgens, estrogens, glucocorticoids, and mineralocorticoids, as well as neurosteroids. 17α-OHP is an agonist of the progesterone receptor (PR) similarly to progesterone, albeit weakly in comparison. In addition, it is an antagonist of the mineralocorticoid receptor (MR) as well as a partial agonist of the glucocorticoid receptor (GR), albeit with very low potency (EC50 >100-fold less relative to cortisol) at the latter site, also similarly to progesterone. Steroidogenesis, showing 17α-OHP around the left-middle among the pregnenes. 17α-OHP increases in the third trimester of pregnancy primarily due to fetal adrenal production. This steroid is primarily produced in the adrenal glands and to some degree in the gonads, specifically the corpus luteum of the ovary. Normal levels are 3-90 ng/dl in children, and in women, 20-100 ng/dl prior to ovulation, and 100-500 ng/dl during the luteal phase. Measurements of levels of 17α-OHP are useful in the evaluation of patients with suspected congenital adrenal hyperplasia as the typical enzymes that are defective, namely 21-hydroxylase and 11β-hydroxylase, lead to a build-up of 17α-OHP. In contrast, the rare patient with 17α-hydroxylase deficiency will have very low or undetectable levels of 17α-OHP. 17α-OHP levels can also be used to measure contribution of progestational activity of the corpus luteum during pregnancy as progesterone but note, 17α-OHP is also contributed by the placenta. Earlier immunoassays like RIA (radioimmunoassay) or IRMA (immunoradiometric assay) were used to clinically determine 17α-OHP. Today more sophisticated methods use gas or liquid chromatography and mass spectrometry (e.g. LC-MS/MS). Although 17α-OHP has not been used as a medication, its pharmacokinetics have been studied and reviewed. Esters of 17α-OHP, such as hydroxyprogesterone caproate and, to a far lesser extent, hydroxyprogesterone acetate and hydroxyprogesterone heptanoate, have been used in medicine as progestins. When "hydroxyprogesterone" is referenced from the standpoint of medical use, what is usually being referred to is actually, in general, hydroxyprogesterone caproate. 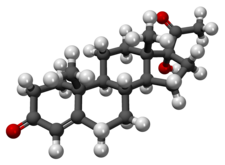 17α-OHP, also known as 17α-hydroxypregn-4-ene-3,20-dione, is a naturally occurring pregnane steroid. It features ketone groups at the C3 and C20 positions, a hydroxyl group at the C17α position, and a double bond between the C4 and C5 positions. 17α-OHP is the parent compound of a class of progestins referred to as the 17α-hydroxyprogesterone derivatives. Among others, this class of drugs includes chlormadinone acetate, cyproterone acetate, hydroxyprogesterone caproate, medroxyprogesterone acetate, and megestrol acetate. Hydroxyprogesterone is the generic name of 17α-OHP and its INN and BAN. ^ a b c J. Elks (14 November 2014). The Dictionary of Drugs: Chemical Data: Chemical Data, Structures and Bibliographies. Springer. pp. 664–665. ISBN 978-1-4757-2085-3. ^ a b c I.K. Morton; Judith M. Hall (6 December 2012). Concise Dictionary of Pharmacological Agents: Properties and Synonyms. Springer Science & Business Media. pp. 146–. ISBN 978-94-011-4439-1. ^ a b c Index Nominum 2000: International Drug Directory. Taylor & Francis. January 2000. pp. 532–. ISBN 978-3-88763-075-1. ^ a b Attardi BJ, Zeleznik A, Simhan H, Chiao JP, Mattison DR, Caritis SN (2007). "Comparison of progesterone and glucocorticoid receptor binding and stimulation of gene expression by progesterone, 17-alpha hydroxyprogesterone caproate, and related progestins". Am. J. Obstet. Gynecol. 197 (6): 599.e1–7. doi:10.1016/j.ajog.2007.05.024. PMC 2278032. PMID 18060946. ^ Pijnenburg-Kleizen KJ, Engels M, Mooij CF, Griffin A, Krone N, Span PN, et al. (2015). "Adrenal Steroid Metabolites Accumulating in Congenital Adrenal Hyperplasia lead to Transactivation of the Glucocorticoid Receptor". Endocrinology. 156: en20151087. doi:10.1210/en.2015-1087. PMID 26207344. ^ Sun, Kang; Lei, Kaiyu; Chen, Li; Georgiou, Ektoras X.; Sooranna, Suren R.; Khanjani, Shirin; Brosens, Jan J.; Bennett, Phillip R.; Johnson, Mark R. (2012). "Progesterone Acts via the Nuclear Glucocorticoid Receptor to Suppress IL-1β-Induced COX-2 Expression in Human Term Myometrial Cells". PLoS ONE. 7 (11): e50167. doi:10.1371/journal.pone.0050167. ISSN 1932-6203. PMC 3509141. PMID 23209664. ^ Die Gestagene. Springer-Verlag. 27 November 2013. pp. 276–277. ISBN 978-3-642-99941-3. ^ a b Jeffrey K. Aronson (21 February 2009). Meyler's Side Effects of Endocrine and Metabolic Drugs. Elsevier. pp. 289–. ISBN 978-0-08-093292-7. ^ a b Robert Alan Prentky; Ann Wolbert Burgess (31 July 2000). Forensic Management of Sexual Offenders. Springer Science & Business Media. pp. 219–. ISBN 978-0-306-46278-8. ^ a b H. J. Smith; Hywel Williams (1 January 1983). Introduction to the Principles of Drug Design. Elsevier. pp. 187–. ISBN 978-1-4831-8350-3.